Enchanted Forest is magical interactive experience for all ages, installed at the Government Center promenade. The Forest contains multiple hands-on exhibits and responds to the natural environment, as it highlights the role of trees as an essential part of our public health infrastructure. The Enchanted Forest is part of a nighttime art festival called Immersion, part of HUBWeek taking place Thursday, Friday and Saturday from 6—10pm at City Hall Plaza (Oct 12—14th 2017). 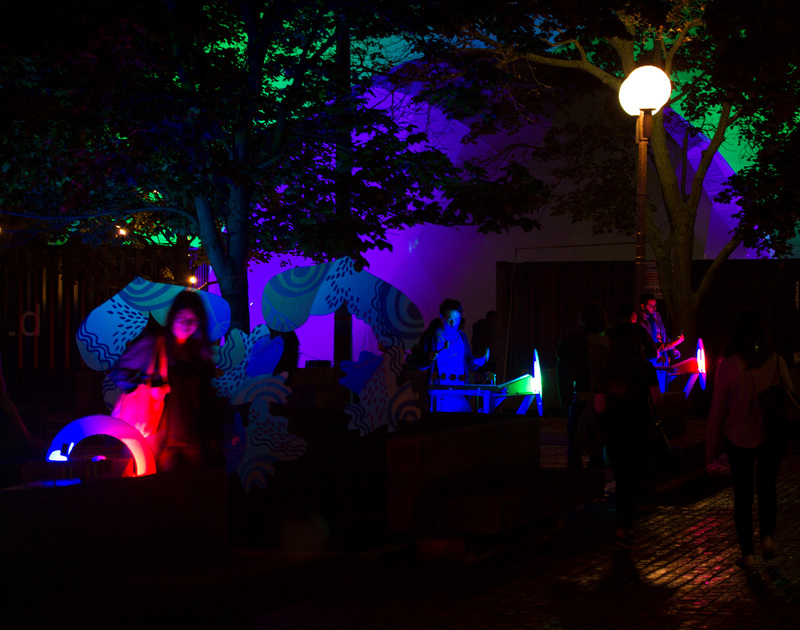 The Enchanted Forest contains 7 custom wooden Xylophones, 6 of which we mounted spinning wheels. The spinning wheels mask red, green and blue LED floodlights that project onto multi colored wooden leaves. As the wheels spin the the wooden leaves change color, animating over time. Additionally 20 wooden birds hang from trees. By pulling on the birds they light up and sing, also telling other birds to sing. Each bird contains an Android phone with custom programming written in Processing and is networked of wifi. All technology is hidden behind wood, preserving the intimate feeling created by the actual live trees planted all around the space. This project was funded by HUBWeek. Maria Finkelmeier of Masary Studios playing an Enchanted Forest Xylophone. Video by Sam Okerstrom-Lang “Samo” and Andrew Ringler. Participants Playing the Xylophone and Spinning the Spinny. Spinning Wheels Graphics During the Daytime. Boston Globe’s Facebook Live interviews Andrew Ringler about the Enchanted Forest. Segment from “Check out what we’re seeing on City Hall Plaza as HUBweek sets up its domes” —2017-10-11.